You may specify a large secret burning task, which may include wiping unused disk space, cleaning your computer from any internet and document links, application plugins, the wipe lists. 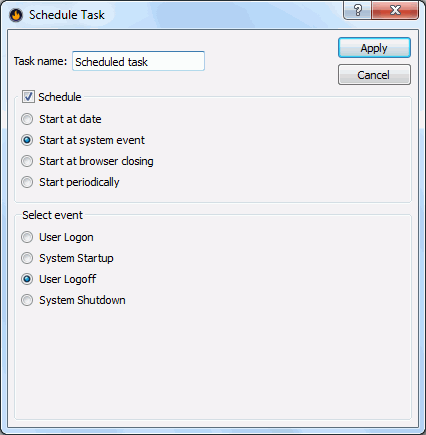 You may start this task immediately or set a special time or system event when this task will be started automatically. 2 Select the items you want to clear and wipe. See more details on the Cleaning Computer help section. 3 Click the Start button and select Burn now if you want to start this task immediately, or Schedule... to specify the time or event when SecretBurner will launch the task. 4 Select the necessary options and task name, and click the Apply button. Select this option and specify the date and time on which you want this task be launched. Select this option and the browser on which closing you want this task be launched. Select this option and the time interval in which you want this task be launched. > When the date/event occurs, will launch the task.